Bruxism is a disease which is seen when sleeping at night and which has a possibility of causing serious problems (gum recession, tooth cracking, joint problems etc.) over time if precautions are not taken. Bruxism occurs when the upper and lower teeth are subconsciously grinded on each other due to the fact that stress, which accumulates during the day, is released while sleeping at night. What are the problems bruxism causes? And people’s being disturbed by the grinding noise. What is the treatment of bruxism? Soft or hard night splints which are produced after measurement of your teeth is taken are recommended. These splints must be changed periodically. In addition, patients’ reducing stress in daily life is also important for the success of the treatment. Do I clench my teeth only at night? Contrary to popular belief, clenching the teeth is observed not only at night but also during the day. Patients can prevent this situation by raising awareness. It is a disease which occurs on hard and soft tissues of temporomandibular joint which connects upper and lower jaws to one another. In this joint disease, minor symptoms such as rattling noises from the joint and major symptoms such as locked jaw can be observed. It may occur due to various reasons (accidents, wrong treatment, stress, habits etc.). Joint syndrome increasingly proceeds over time. For this reason, the sooner you start a treatment, the better the success of the treatment will be. What are the problems caused by temporomandibular joint disorder? Limited range of mandibular movement. Temporomandibular joint syndrome does not show up in a day. It shows indications over time and if initiation of treatment is delayed, indications may turn into serious problems (locking of the jaw, jaw displacement, not being able to open the mouth etc.). And pain in neck and shoulders (especially among women) are major symptoms. 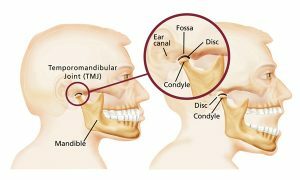 What are the causes of temporomandibular joint disorder? 3) Person’s being under stress. It causes more problems than other factors. Because people who are under high levels of stress consistently strain their face muscles. So, more pressure is put on the joints. Does my jaw get dislocated if I do not get temporomandibular joint treated? In advanced stages of join syndrome, permanent deformations may occur in tissues and structures around joint area and during mandibular movement, jaw might be displaced if joint comes too forward. Main problem is not the displacement of the jaw because it can be popped back in its place with basic exercises. However, main problem is this situation’s occurring frequently and causing severe pain. I have temporomandibular joint disorder. What should I pay attention to? Abstaining from stress as long as possible. What is the effect of stress on temporomandibular joint disorder? Muscles around the face are capable of contracting to the least reaction. One of the effects of stress on humans is that muscles can stay contracted without relaxation for a long time. Thus, in stressful situations, muscles contract, teeth come into contact with each other putting excessive pressure on joints. What should I pay attention to during temporomandibular joint treatment? You should use the joint splint as your dentist recommended and certainly follow the instructions to which you should pay attention. How long will I use the joint splint? Joint treatment lasts approximately 3 months. However, considering the severity of the problem, this period may lengthen. How should I keep the joint splint? Joint splint is kept in his box covered with a clean moisturized cloth. How is joint splint cleaned? When you take it off in the morning, you should clean it under running water with liquid hand soap and an old toothbrush. How often should I go to examination? After splint is put, you should come to visit at the end of the first week, third week and third month. How can I understand that I am recovering? In temporomandibular joint treatment, considering the severity of the problem, full recovery may not be achieved. The recovery criterion in this problem is your being able to perform daily mandibular movements (eating, talking, swallowing etc.). Are there any physiotherapy exercises apart from joint splint? In certain cases, you may be given physiotherapy exercises in order to strengthen the muscles or get rid of limited range of mandibular movement. How can I understand that I have temporomandibular joint disorder? There are many signs and symptoms of join syndrome. These can vary from clicking noises to severe pain. You should consult your doctor when you feel any difference in your jaw because the stage of the disease highly affects the benefit of the treatment.